My Little Slice of Bliss: Ways With Washi: WREATHS + a Giveaway! Greetings, DeNami friends! It's time for my December edition of Ways With Washi over on the DeNami Design blog! Today I thought I'd show you a couple of ways that you can use washi tape to build your very own DIY wreath embellishments. Let's take a look! For my first project, I used two green DeNami washi tapes to build a wreath. I started by punching out two nesting circles from white card stock. Then I used scissors to trim fringe along one side of a long strip of Green Graph Washi Tape and adhered it around the perimeter of the larger circle with the fringe pointing outward. I gave the same fringe treatment to a long piece of Green Stripes Washi Tape and adhered it around the smaller circle. After stacking the smaller fringed circle on top of the larger circle, I filled the center of my wreath with a tiny sentiment from the Christmas Greetings Petit Four stamp set. At this point, I simply added a few red sequins and a loopy bow tied from baker's twine, and my wreath embellishment was done! I love pairing pink with green as a nontraditional color scheme for Christmas! Next up is a larger wreath created with my favorite Christmas color combo. For this wreath, I adhered strips of Pink Stripes Washi Tape and Green Graph Washi Tape around a cardstock ring created with punches. Once all of the tape was securely fastened in place, I used my trusty scissors to trim swallowtail notches in the end of each little banner. Sweet, don't you think? And that brings this Ways With Washi to a close! It's so hard to believe that this is my last DeNami monthly feature for 2013. It's also my last Ways With Washi feature. I've nearly exhausted my list of interesting ways to use washi tape in papercrafting projects! But never fear, I'll be back with a brand-new monthly feature here on the DeNami blog in 2014! In the meantime, I'd like to offer you the chance to win a roll of washi tape to play with! I'll leave commenting open until 11:59 p.m. EST on Thursday, December 26, 2013, and will draw one commenter at random. The winner will be announced right here on my blog on Friday, December 27, and if I'm able to find an email address, I'll be sure to contact the winner as well. Thanks for checking out Ways With Washi today! Love both of your washi tape wreaths Emily! The pink and green one is so pretty! Can't wait to see your new feature next year! Merry Christmas to you!! You know I'm a follower! :) Through blogger! Oh Emily you do the cutest things with washi tape. Things I would never think of and they are so darn cute. I love the cookies on the pink and green wreath! Merry Christmas to you. I am a follower through google friend connect. Thanks for a chance to win. What cute wreaths and with washi tape! Great ideas! Merry Christmas Emily! Thanks for sharing your fun talent with us! Wonderful Christmas cards with Washi, Emily! Gonna see if I have a combo to use this way as I need one more card. Thanks for all the inspiration! I do follow you in Feedly. Merry Christmas! Your cards are so sweet Emily! I love all the fun ideas you come up with for using washi tape. SO festive and CUTE Emily!! These are both a delight but I REALLY like the second one!! Merry Christmas to you and yours!! You are always so creative with how you used washi! Love the wreaths! Wishing you a blessed Christmas ((hugs))!! These CHRISTMAS wreaths are so fun, Emily! 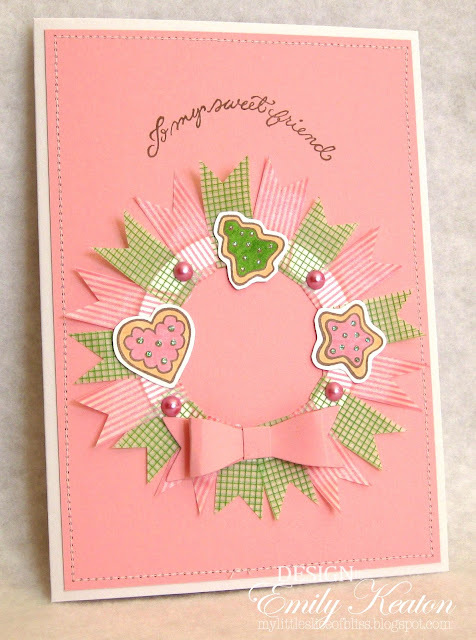 Especially loving the pink and green cersion with sweet little cookies attached. You have such a wonderful way with Washi! Love the wreath card and second card in pink and green! Merry Christmas! Very cute washi tape wreaths. I have enjoyed your series on how to use washi tape. Thanks you and have a Merry CHRISTMAS! way to use the washi. Christmas wreaths made with Washi Tape. What a cool idea. Merry Christmas! Great wreath ideas! Love the look of the washi tape! I'm already a follower here too! What great use of that washi! Great idea for Christmas cards! Thanks for the chance---Merry Christmas to you! I am also a very proud follower! Merry Christmas again! Such clever ways to use your washi to create those wreaths! I hope that you have a wonderful Christmas Emily! What a cool idea! Love how you used washi in both wreath. Merry Christmas! I follow you through bloglovin. Thanks for the chance!